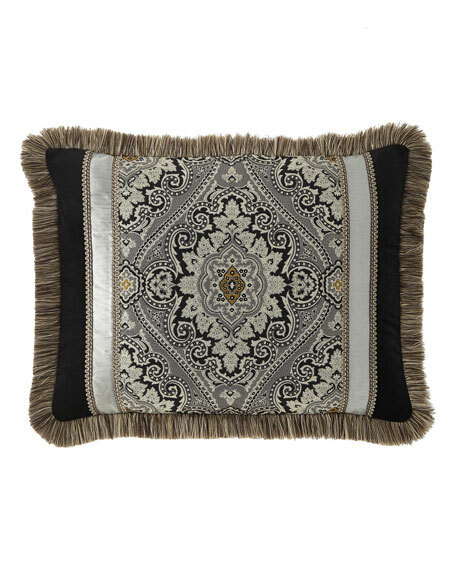 Sham with brush fringe edge. Waffle knit sham. Self flange with raw edge finish. Cotton; machine wash. 20" x 36". Imported. Sham has damask center, velvet sides, and ruched insets. Cotton. Finished with gimp trim and brush fringe. 20" x 36". Sham has damask center, velvet sides, and ruched insets. Cotton. Finished with gimp trim and brush fringe. 20" x 36". Dry clean. Made in the USA of imported materials.